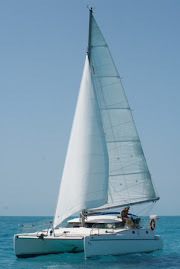 Another 24 hour sailing trip brought Irie and her crew from Santa Marta to Cartagena. Lack of wind and the urge to pass the Rio Magdalena before dark had us motor for six hours on end. Once through the murky mess of the river delta at Barranquilla – luckily without big, damaging debris about 5 miles off shore – we could take full advantage of the brisk wind that had picked up while we were keeping a close eye on our brown surroundings. The challenge now was to slow down enough to avoid reaching our next port before dawn. It was blowing over 25 knots and we were flying, while reducing our jib to almost nothing. For the first time since leaving Grenada, no squalls passed us and, except for the odd salty wave crashing over the side, we stayed dry the whole 110 miles! On the morning of December 15th, we entered unattractive Cartagena Bay without adding ourselves to the statistics of beaten up sailors, ripped sails and sinking cruising boats (one did just that off Barranquilla two nights before we left), results of the reputedly dangerous coast – weather wise - of Colombia. While anchored in very deep, dark brown water, surrounded by ugly high rise buildings and a noisy, smelly industrial port, without any wind to keep the surrounding boats “in place” at a safe distance and whilst being tossed around by the constant wake of passing pleasure and local boats, we hoped our stay would become worthwhile and that Cartagena would live up to its attractive reputation. It rained for days on end – we made it here right in time - and during an afternoon break, Mark and I walked the 20 minutes to the old walled town of Cartagena. We aimlessly strolled through its narrow, characteristic streets with historical buildings and protruding balconies, gazing at picturesque churches and plazas and taking in the scene from a bench in one of the parks. A walk on the ramparts is said to be a romantic past time at night, so we just had a quick glimpse for now and postponed this event until later. After the afternoon’s exploits, we hoped to come back one day for a “real” historical tour when the sun would be out and the town would be shown in all its glory. In the meantime, we ran some needed boat errands and met up with cruising friends visiting from Santa Marta. At night, Cartagena turns festive and becomes even more alive. The structures are lit up and chairs and tables dot the alleys and squares. Vendors become more persistent and the atmosphere is totally different. We are both looking forward to explore a bit more soon!